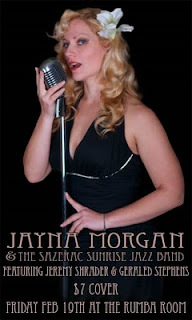 Remember, the Red Hot Lindy Hop will have live music tonight at the Rumba Room from Jayna Morgan & the Sazerac Sunrise Jazz Band, featuring Jeremy Shrader and Gerald Stephens. Free lesson at 7:00 p.m., and the band starts at 7:30 p.m.
Free admission at the door before 7:00 p.m., and $7 afterwards. For more information on Jayna and the band, check out their MySpace page.